Father Bryan Dalton: Born Aug. 4, 1945; ordained June 7, 1970; died Nov. 30, 2018. This story has been updated with the times for the viewing and funeral Mass. DEERFIELD BEACH | After a seven-and-a-half-year battle with cancer, Father Bryan Dalton has died, in the place he called home for the past 25 years, the rectory of St. Ambrose Church. He died the afternoon of Nov. 30, with his sister, Mona, and two of her children, Jillian and Bryan, as well as their spouses, at his bedside. Father Dalton was 73 and had been a priest for 48 years. A wake will take place at St. Ambrose from 3 to 9 p.m. Monday, Dec. 3, with a prayer service at 7 p.m. 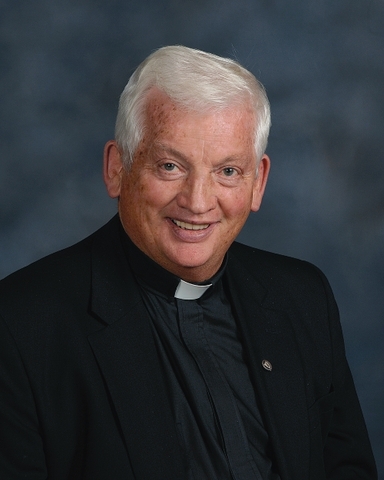 The funeral Mass will be celebrated Tuesday, Dec. 4, at 11 a.m., also at St. Ambrose. “About a year ago it got really rough. But he never gave up. He didn’t want to leave any of us right up until the end,” said Bob Colasanti, St. Ambrose’s parish manager, who had worked with Father Dalton for the past 32 years. Blessed with an Irish sense of humor but a tendency to shyness, Father Dalton was known for his love of the poor. “Every Christmas and Easter he would encourage the parishioners to bring in toys and Easter baskets,” Colasanti said. He figures over the years the parish collected over 50,000 toys and an equal number of Easter baskets. Eight years ago, Father Dalton started a Helping Hands food pantry that feeds over 300 people every week. “The homeless would show up here to talk to Father and he’d say, ‘How did you hear about me?’ And they would say, ‘The police told me: Go to Father. He’ll help you,’” Colasanti recalled. With Father Dalton as pastor, St. Ambrose was always available to anyone who needed to bury a loved one. Father Dalton’s death comes 11 months after that of his older brother, Father Brendan Dalton, longtime pastor of St. Bernadette Parish in Hollywood, who died Dec. 31, 2017. “It was very difficult for Father to accept that loss. They were only a year apart in the seminary and they shared so much in their priesthood,” Colasanti said. Together, the Daltons provided 96 years of priestly service to the Archdiocese of Miami. John Bernard Dalton – better known as Bryan by all his relatives – was born Aug. 4, 1945 in Listowel, County Kerry, Ireland. He was the youngest of four children, two boys and two girls. The Dalton brothers followed two uncles and a cousin into the priesthood. Their uncles served in Kentucky, their cousin in Ohio. Father Dalton was ordained June 7, 1970, in Waterford, Ireland for the Archdiocese of Miami. He first served as parochial vicar at St. Juliana in West Palm Beach (1970-72) and St. Monica in Opa-Locka (1972-76). From 1976 to 1984 he served as parochial vicar at St. Ambrose, where he would return as pastor in 1993. Before that he served as pastor of St. Richard (now Holy Rosary-St. Richard) in Palmetto Bay, from 1984 to 1993. In addition to his sister, Mona, and niece and nephew Jillian and Bryan, Father Dalton is survived by Mona’s other son, Jamie and his spouse; and by his other sister, Rosemary, and her children, Orla, John and Carol, all of whom live in Ireland.